A little over a week ago, I went to the Tamp & Tap for lunch while working at FedExForum. It was a departure from the usual for me (Flying Saucer, Bardog Tavern, Aldo's Pizza Pies, Second Street Shoppers (when I'm broke) or anything on Beale Street), but I wanted to try something new. With the buzz surrounding the new coffeehouse on Gayoso Ave., I figured it was a good place to satisfy my goal. Unfortunately, I didn't have an online guide to advise me on what to order (unlike my visits to El Gallo Giro), but I believed that I made a good choice nonetheless. After looking over the menu, I randomly chose The Imperial. 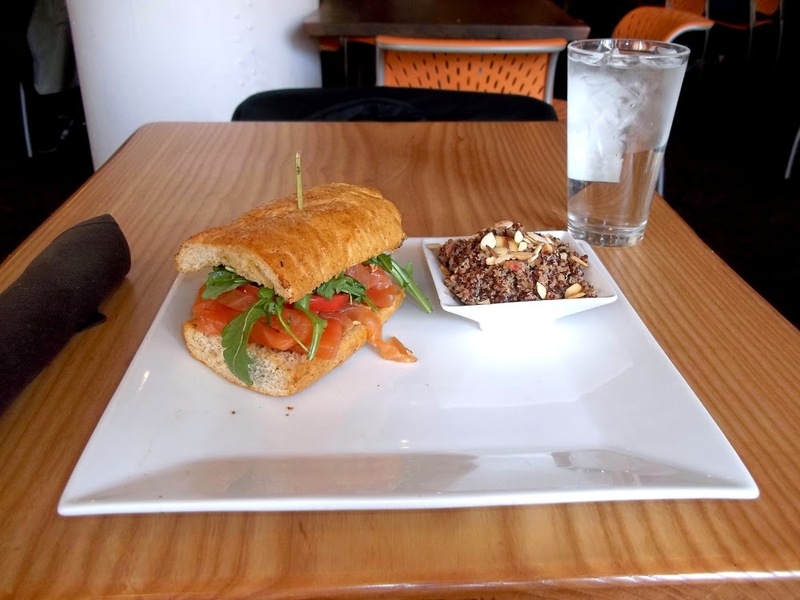 It is a sandwich consisting of salmon, cream cheese, capers, tomatoes and one of America's latest "en vogue" vegetables, arugula. The leafy veggie gave the sandwich a bitter kick that coalesced with the flavors of the house cured salmon, chipotle cream cheese and capers. Personally, arugula is either hit or miss with me. Its bitter taste is a turnoff whenever I eat it raw but it isn't too bad when it's cooked (to read about my other arugula experiences, click here). Fortunately, the raw arugula contributed positively to a great tasting sandwich and a memorable experience. All the sandwiches at Tamp & Tap come with a side item. Initially, I considered getting something typical like potato chips. Instead of that, I went with another vegetable that Americans and the rest of the world are currently craving for. 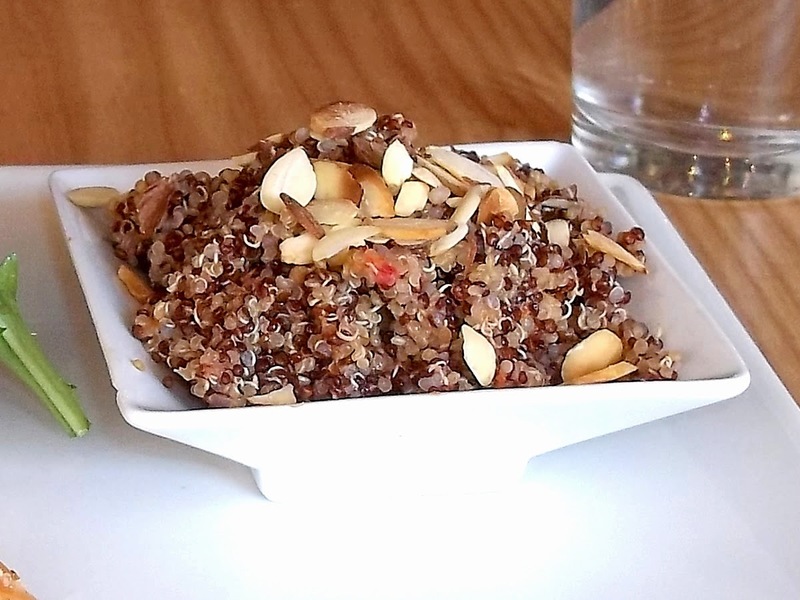 Quinoa (pronounced "kee wah") is (according to Wikipedia) "a grain crop grown primarily for its edible seeds." Originating in South America, quinoa has become very popular with people (especially with my friends on Pinterest) looking for healthy foods. With me consistently eating cheeseburgers and the like, a staple like red quinoa fell under my radar. Given some of quinoa's benefits are lowering high blood pressure and boosting metabolism, this is something that I really need. Thankfully, the many "pins" of photos on Pinterest swayed me into giving the "pseudocereal" (Wikipedia's term for it) a try. The quinoa is grainy and slightly sweet, which makes it suitable as a topping for many things like sandwiches, salads or even scrambled eggs. With The Imperial, the red quinoa (mixed with almonds) added sweet balance to the tarty sandwich for a well rounded lunch. As much as I like it, any future opportunities to eat quinoa will be rare because of my taste in restaurants. However, I hope more dining establishments add it to their menus for those looking for healthy alternatives. SIDE NOTE: Quinoa is also kosher. Speaking of that, I want to wish my Jewish friends a Happy Passover. Overall, my first experience at Tamp & Tap was great, but because of timing and budget constraints (The Imperial is a bit expensive), I didn't get the full "Tamp & Tap" experience. I returned later for both the "Tamp" in the form of a mocha (lattes are also on the menu) and a "Tap" beer from Memphis Made Brewing Company. The "Tamp" was The Tennessean that consisted of white chocolate, caramel and espresso. Forgive me for not being more descriptive (I'm not a "coffee" expert), but I will say that I tasted all the listed ingredients and I liked it. 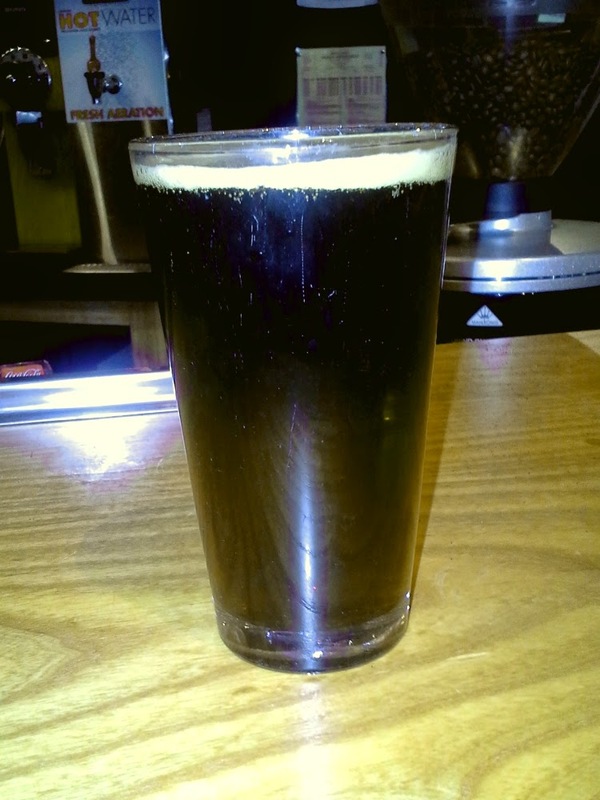 Although I'm not knowledgeable about coffee, I know a few things about beer. That said, Memphis Made's Red Handed really impressed me. The beer is an altbier, Germany's equivalent of a brown ale (described as an amber ale by the brewer). Like its English counterpart, the top-fermenting ale has coffee and caramel flavors (although some might interpret it as chocolate) with little evidence of hops. I believe most will find it very enjoyable to drink, whether at a bar while partying with friends or during dinner. Speaking of that, Memphis Made suggests roast beef, chicken and lamb as complementary with the Red Handed. Also, I believe the "chocolate" ale will go well with a bowl of tarty red quinoa. However or whenever you drink it, I hope you tip your hat to Memphis Made owners Andy Ashby and Drew Barton (the brewmaster) for putting out this excellent beer and others such as the Bent Note (an IPA), Soulful Ginger (a Saison) and Reverberation, a coffee stout made in collaboration with Memphis-based Reverb Coffee Company. I'm sure that the brewery will have a lot success if it keeps on making outstanding beers. In addition to Memphis Made, Tamp and Tap offers many local beers including those from High Cotton Brewing Company and Wiseacre Brewing. 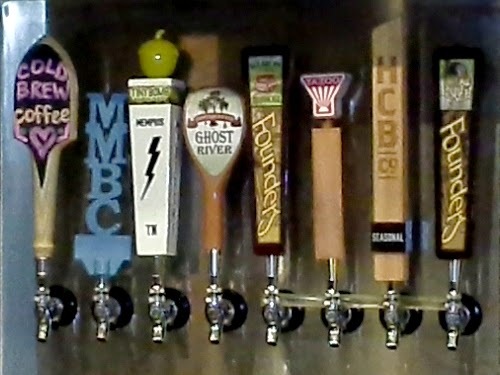 For anyone looking for beer with Memphis flair, Tamp and Tap is the place to go to. 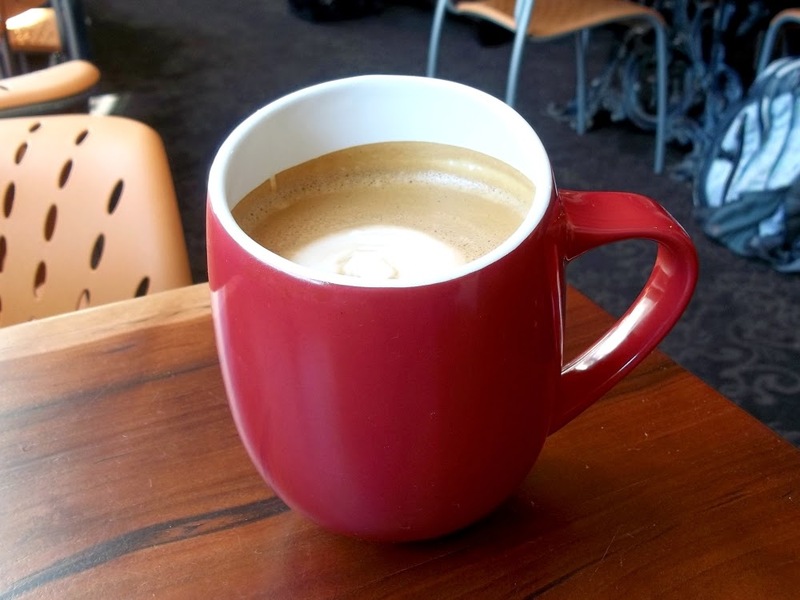 With good food and drinks, Tamp & Tap is an up and coming coffeehouse with great potential. With its rustic décor and casual atmosphere, just about anyone can feel at home with his/her laptop (using free Wi-Fi) while drinking a T & T brew. The coffee house even has a video game console and board games for those who want to have fun. With such a youth oriented concept, Tamp & Tap seems more suited for a college town than in a downtown neighborhood of a major city. Speaking of colleges, Tamp & Tap is very similar to Nashville's Fido that's located near Vanderbilt and Belmont Universities (where I coincidentally had scrambled eggs with salmon and capers). Comparatively, I can see T & T expanding to the Highland Strip near the University of Memphis and competing with Cafe Eclectic for student-customers. For now, given the coffeehouse's main competition in Downtown Memphis is a nearby Flying Saucer and Starbucks, I believe that Tamp & Tap will carve out its niche and be very successful in the future. A couple of months ago, after one of Memphis' cold spells, I worked on "temp" assignments that dealt with busted water lines. One of places where I worked was at a hotel near the intersection of Lamar and Getwell. The area is known more for strip clubs, something that the City of Memphis and Shelby County "brilliantly" did away with (well, sort of; time and tax dollars wasted... err, "well spent"). 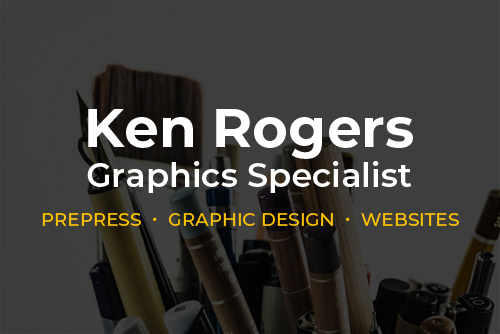 The company that I worked for was under a tight schedule so there was no time for screwing around, which was fine with me. Because of that, I didn't have a lot of options for lunch in an area lacking restaurants. Fortunately, I found a place with the Urbanspoon mobile app that was a short walk from my work site. So in a choice of chance, I ended up in a homely taqueria. El Gallo Giro is a family-friendly restaurant that also caters to working class guys like me. That was important given my strict thirty minute lunch break that I couldn't waste. In deciding what to order, I had my friend Shane guiding my choice. When I mean "had," I don't mean that he was with me. Instead, I got my friend's suggestion via Foursquare when I checked in at the Mexican restaurant. I must say, it is nice that friends can stay constantly connected through smartphones. Anyway, I went with my friend's suggestion of Tacos de Tripa that I initially assumed was Spanish for three tacos. Of course, that assumption lasted only minutes when my server asked how many tacos I wanted. After expressing my desire for three, I grabbed my phone so I could find out what I ordered. It turned out that "tripa" is Spanish for tripe, as in beef stomach and/or intestines. As many might assume, I was apprehensive about my selection. Fortunately, I took a "f#©% it" attitude and got after it. With a lot of faith in my friend, I had a feeling that everything was going to be fine. The tacos erased all doubts after I took the first bite. The spicy seasoning masked any nastiness in the tripe, to the point that it was palatable. Combine that with the zesty toppings of cilantro and raw onions along with a squeeze of lime and a bit of the restaurant's salsa verde and picante sauce, add up to something wonderful. The faith in my friend proved correct, for the tacos turned out great and I hope to have them again. Actually, I did get a second helping of the Tacos de Tripa a day later. Other than the tacos, I wanted to get Shane's recommended beverage for them. 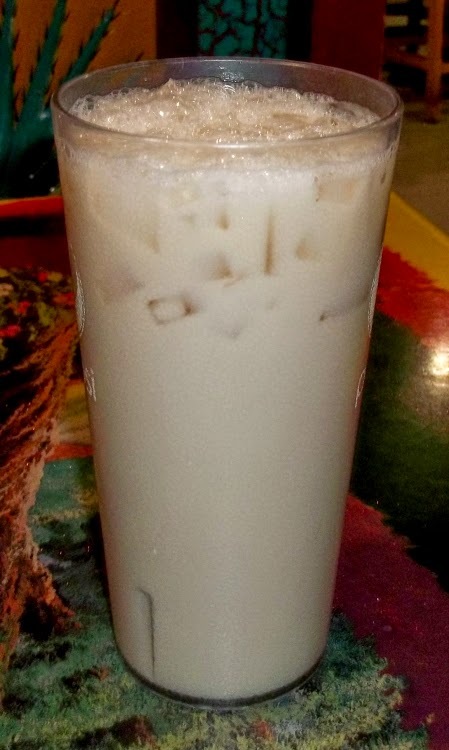 The horchata is a thick, sweet, milky drink made with rice, vanilla, cinnamon and sugar. Like the tacos, I had no idea what I was in for despite confidence in my friend. Fortunately, the horchata was great and really hit the sweet spot. The rice, vanilla and sugar were strong, making for a very flavorful drink. Although it was very good, the extremely sweet drink didn't seem like a good match for the spicy tacos. For me, the horchata pairs better with a torta or any entrée with bread in it. Even though I differ with my friend about the choice of beverage for the Tacos de Tripa (my recommendation: a Corona or any other Mexican lager beer that the restaurant offers), the contrast in taste made for an interesting experience. Many thanks go out to Shane for introducing me to a beverage that I will have more often whenever I'm at a Mexican restaurant. 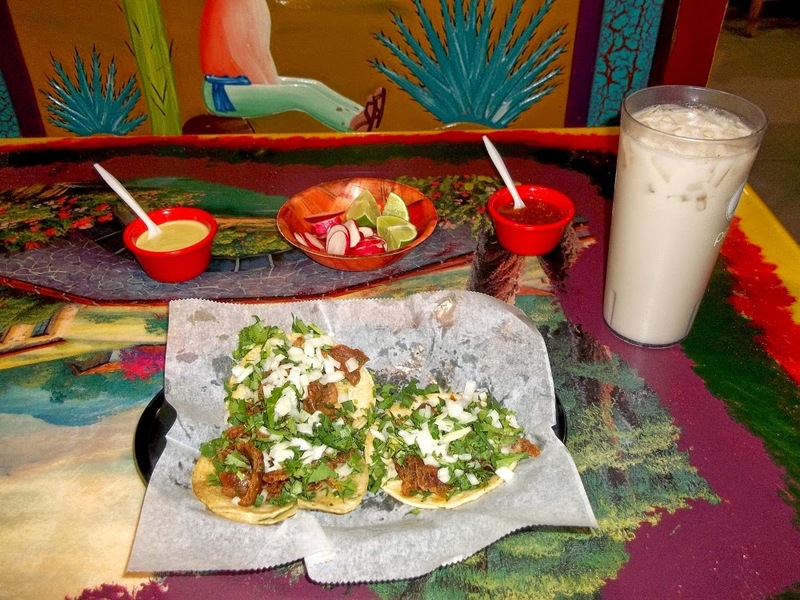 SIDE NOTE: Kids will love the horchata as well as the restaurant itself. 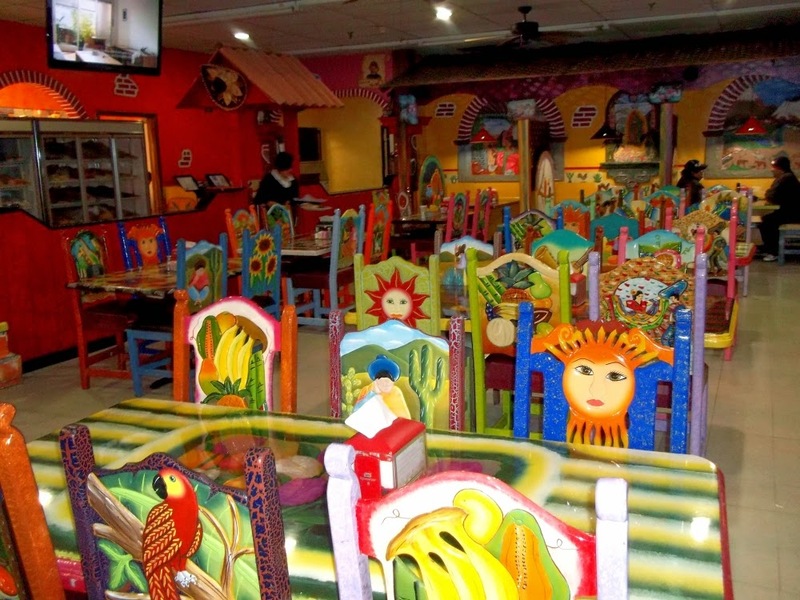 The taqueria's décor is very colorful because of its chairs and tables exhibiting Mexican-inspired art. I'm surprised that the family-centric blog Dining With Monkeys hasn't discovered El Gallo Giro. Far be it for me to suggest what anyone should blog about (although I would love to read Best Memphis Burger's take on P & H Cafe's stuffed burgers), but I believe Stacey Greenberg (blogger for D.W.M.) and her "monkeys" will love it. After my first visit to El Gallo Giro, I tweeted Shane to thank him for the suggestion (albeit indirectly) of tacos. He responded with another tip about the Shakira (not the singer), one the restaurant's many tortas. For the uninformed like me, a torta is a Mexican sandwich that is sort of like a mini muffuletta. At least that's my guess given that I never had one until now. I have seen tortas listed elsewhere but I never thought about ordering one, except when I was at a convenience store in Northeast Memphis (I was too broke to get one). Thanks to encouragement from my friend, I took an opportunity to get a torta. 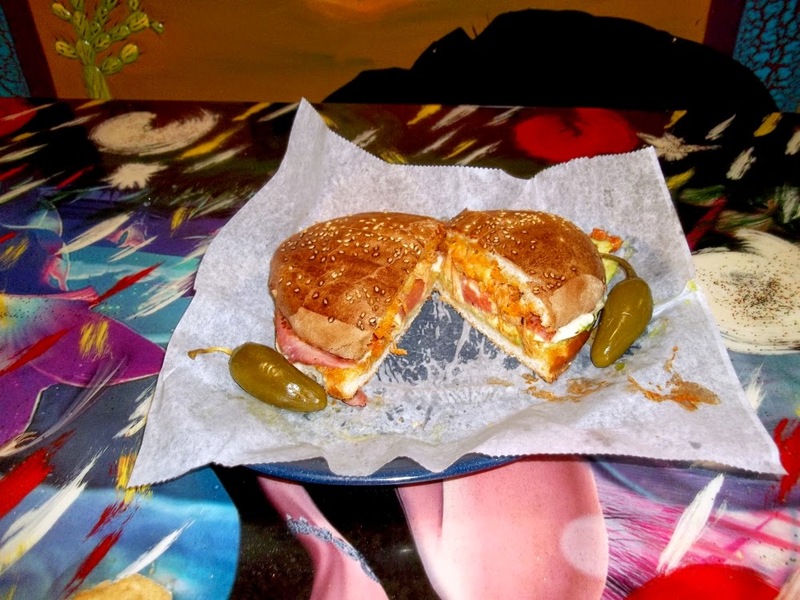 The Shakira (or "La Shakira") is a torta consisting of pulled pork, ham, pineapple, avocados, tomatoes and a white cheese (not sure what it was) within a thick sesame seed bun. The sandwich was quite meaty with the pork being prominent. The sauce on the pork gave it a taste similar to a Sloppy Joe, with everything else playing supporting roles. I assumed that the pineapple would make the torta slightly fruity, but it took a back seat to the pulled pork. Other than that, the biggest standout of the torta was the thick, fresh bun that held it all together. Full of doughy sweetness, the bun played a major role in my opinion of the sandwich. I'm not sure if the restaurant bakes them, but I will compliment it for the buns regardless. Earlier, when I said that a horchata would go well with a torta, the reason for that is the bun's doughy flavor meshes well with the sweet Mexican drink. Overall, the Shakira is an awesome sandwich that I'm lucky to have had. Thanks again to Shane for hipping me to it. In all, I enjoyed everything that I got at El Gallo Giro. The food is excellent and I believe that there isn't a bad meal in the place. 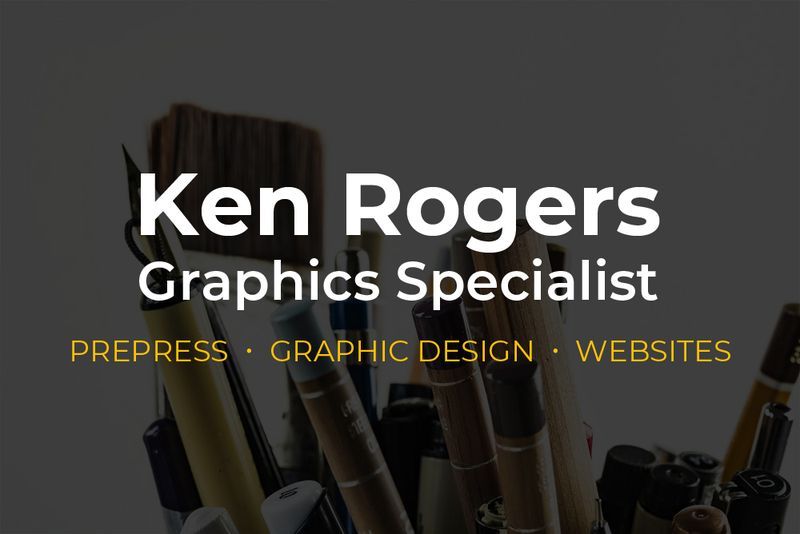 The restaurant's staff was very friendly and helpful, something that I greatly appreciated. Getting back to my first visit, the restaurant got my tacos within minutes after I placed the order. This happened despite my spending a lot of time reading the menu, something that eventually didn't matter. In staying within my thirty minute window for lunch, I returned to work on time with minutes to spare. With service that matches the quality of the food, El Gallo Giro is a place that I'm recommending to friends and anyone else looking for a nice Mexican restaurant. In closing, I want to thank Shane again for the outstanding recommendations at El Gallo Giro. Shane, who I have known for several years, is someone who has been a loyal friend in good and bad times. He's had my back when others haven't, and I feel indebted to him for it. Shane is a good man who I and many others are very lucky to have as a friend. Despite my many faults, I hope I'm good enough to reciprocate in kind. He deserves nothing less than the best.